Private mooring of your boat in front of your Townhouse and direct access to the beautiful Noosa River is a unique and convenient feature. 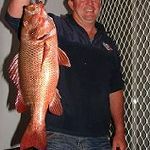 We are the only resort in Noosa Australia that offers this secure facility. Enjoy the unparalleled private, waterfront views from inside and out of our luxury townhouses. 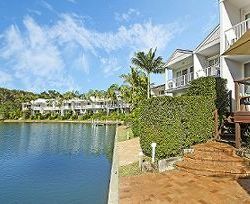 No other resort in Noosaville can offer a private waterfront garden. Self contained townhouses, with great property features, our caring management team will help satisfy your needs while you unwind. A great holiday getaway for families, couples or a group of friends. 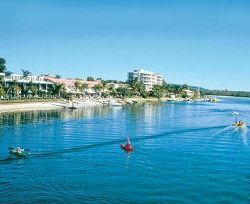 The perfect positioning of PORTSIDE NOOSA WATERS allows for easy access to all of the adventure and activities that both Noosa and the greater surrounds of the Sunshine Coast offer. The choices are endless of what to experience while visiting Noosa Australia. Based on our local knowledge and experience, our Tour Desk Team can assist in finding tours and activities that will suit you while on holiday.